This is the first book I read as part of the German Literature Month 2011 hosted by Caroline @ Beauty is a Sleeping Cat and Lizzy @ Lizzy's Literary Life. fanatical child trapped inside this young man, standing at the table with eyes aglow, having forgotten everything around him, apparently no longer aware that there was anything else in the laboratory but himself and these bottles that he tipped into the funnel with nimble awkwardness to mix up an insane brew that he would confidently swear - and would truly believe! - to be the exquisite perfume Amor and Psyche. Baldini shuddered as he watched the fellow bustling about in the candlelight, so shockingly absurd and so shockingly self-confident." Perfume is the story of an unusually talented perfumer named Jean-Baptiste Grenouille, who has the best sense of smell in the whole of Paris (and, every other place); but who, ironically, has no scent of his own. Though outwardly harmless, people find Grenouille disturbing. Even as a mere baby, he is considered to be possessed by the devil. This strange man is a bad omen for everyone he meets, overturning their fortunes, destroying their lives. 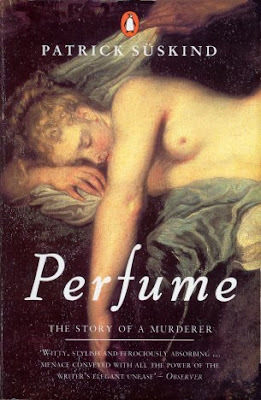 As the book proceeds, Grenouille becomes darker and more inhuman; and in the quest of creating the perfect perfume, he turns into a murderer. I have never read a plot like this one, nor seen similar characters. I liked Grenouille's character as the ultimate anti-hero, and I loved that we got to know the detailed stories of even the minor characters, even though they weren't always that pleasant. I agree, the book is amazingly unique; in fact, I haven't read a book in my life that focused on the sense of smell. I loved the underlying theme of obsession in the book; and the way it gives a great insight into people through one of our most downplayed senses. It's incredibly creative. But it's also excruciatingly long. German sentences can pass off being long and complex - that's how they usually are. But Patrick Süskind's writing isn't that suitable for a translation. I don't like English books that have paragraph-length sentences. Nor do I like authors who insist on describing every single thing in every possible way. For the first part of the book, I almost gave up reading several times. I am glad I continued though, because the second part is where things get really wonderful! I suppose I would have liked the book more had it been shorter. Well, I first came across this book because Rammstein have a song based on it - though the Kurt Cobain thing does kind of beat that; I didn't know it. Yeah, I guess even if I didn't love all of the book, I was definitely impressed by it too! I loved this. I was so fascinated by the descriptions of scent and perfume, I really thought I could smell everything. It is very unusual, I agree. This was one of the strangest books I've ever read. It was kind of gross and made me shudder and want to shower afterwards - but wow! The writing and story were just so weird and amazing. I love it when authors have that kind of hold over me. Trish - It was very strange, and it grossed me out at times too. But it was involving and very different than most books I've read!! Hi, I've just read this for German Literature Month too. I really enjoyed it, I loved the descriptions of all the smells. I thought it went a bit strange halfway through when Grenouille lived in the cave but it soon got back on track with an exciting and bizarre ending. Nice review, Priya! I read 'Perfume' sometime back and loved it. It is one of my favourite books and I love Süskind's prose. I agree with you that it brings out the sense of fragrance so beautifully. Vishy - I can see why the book makes it to most people's favourite books. I suppose it will take some time before I stop reading only Stephen King and Terry Pratchett and start enjoying this literary-romantic sort of prose more.. I did find the writing beautiful, though!